Many many thanks for all your wonderful messages of sympathy on Oscar’s passing. It has meant a lot to me. And threw some rose petals into the water as a way of honouring my furry friend. Decided to honour Oscar in his favourite activity: diving into the lake. And placed it on the jetty. Enjoying the autumn scenery and good memories of Oscar. I’d say that a part of him lives on in Ruby, who is now our own dog. Be warned: you might see more pictures of wet (and dry) dogs here on my blog after all! For more good memories, please visit: Our World Tuesday. 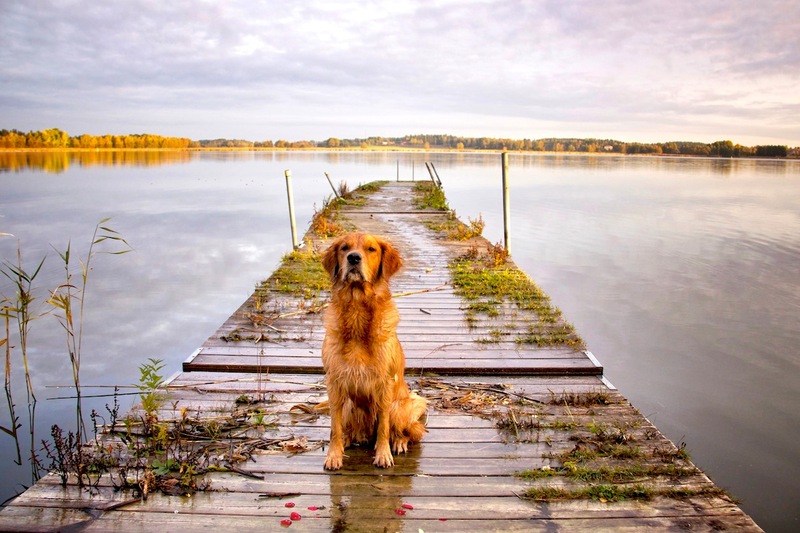 Posted in dogs, Our World TuesdayTagged diving, diving dog, golden retriever, jetty, lake, Nature, roses, tribute, wet dogBookmark the permalink. Very very nice act and the photos are great. Glad you have a new 4-legged friend, times are hard I do understand. Ruby is such a sweetie too. I do prefer my goldens with some colour rather than the modern white ones. Ruby is able to be another Oscar, isn’t she beautiful. What a sweet story full of symbolism and thanks to Ruby. Lovely shots. I especially like the third one with Ruby on the jetty with the retrieved rose petals. Such a heartfelt post and we all look forward to your pictures. Oscar was my virtual pet. I miss him but yes, as you said, Ruby will give us company now. Such a sweet gesture. Love the look of Oscar’s granddaughter. She has a lot of her great-granddad in her, and that’s a great thing. I look forward to seeing more of Ruby. What a SWEETIE Ruby is! Thanks for the warning Fiona…..looking forward to them. Welcome Ruby. You are now among us. I will be waiting for your lovely photos. Best thing you could do is get Ruby! Welcome to Ruby! So nice she is here to carry on in Oskar’s tradition. Your lake would not be the same without a sweet wet dog. Ah, to have loved and lost… If you didn’t love him, you wouldn’t miss him! Lovely photos. Ahhh—how wonderful. So glad that RUBY is now YOURS. I’m sure that Oscar is smiling down from his ‘cloud’ up there!!!!!! Ruby will help keep Oscar alive in your memories. Yes. The Ruby is a particle Oscar. I am very touched. I loved Oscar. Do not forget it. Ruby is very similar to it. Ruby is beautiful. Bring on the images of Ruby. I, for one love’em. For all you dog lovers, a short, moving post here from Lady Fi. Beautiful place. Oscar and Ruby are having a great time. So sorry to hear about Oscar. You honored him in a beautiful way. My heart hurts for you. Ruby is a real sweetie! Love that first shot and how she retrieved some of the petals. I am very much looking forward to seeing Ruby here. She sure is a beautiful girl. So sorry to hear about Oscar! It looks as though Oscar will live on not only in cyberspace through the many wonderful shots you took of him in the past but also in the DNA of his great-granddaughter! How interesting that Ruby retrieved a rose. Thank you. These shots are of Ruby – but she does look very similar to a young Oscar, doesn’t she? We won’t forget wonderful Oscar. It is good to know that his spirit (and genes) live on in your home. Sweet Ruby — she remembers too! Awww it looks like you have a true sweetie in Ruby. I’m glad she’s staying. Hi1 Ruby is very cute.Looking these Ruby photos, I remember Oscar. Thanks for sharing. What beautiful pictures of Oscar’s legacy. As stunning and moving as they are, though, I bet they don’t compare to the legacy of memories that live on in your heart. I teared up just now thinking of the companionship I’ve seen in Oscar, how it reminds me of our McGee who also lives on in our memories. Sending hugs and a scratch behind the ear or extra toss of the stick to fetch for Ruby. Wonderful shots and a great way to honor Oscar. Very happy to see lots of images of lovely Ruby – both wet and dry. I think its so lovely that a wee piece of Oscar lives on in her. Bitter sweet. For en fin minneseremoni … Ruby er også en skjønn hund. For noen bedårende øyne! Oh my, that first shot of Ruby reminds me of Oscar.. She is a beautiful golden. Great shots. Enjoy your week! Oscar must be smiling at Ruby and you all! How sweet Ruby retrieved the memory of Oscar on the jetty he loved so much! 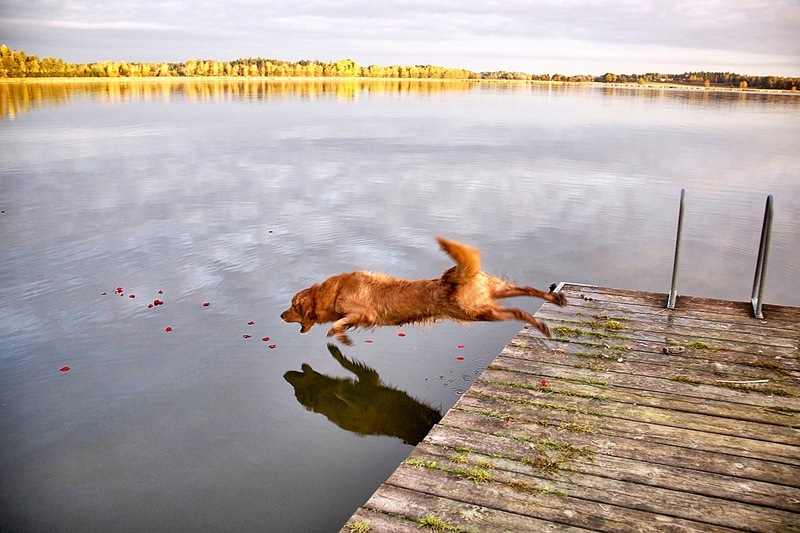 Fiona, that first photograph of Ruby diving into the lake to retrieve the rose petals is incredible! I love how caught her mouth open and her reflection in the water. AMAZING capture! And what a sweet, precious face she has! You captured the moment perfectly, Lady Fi! 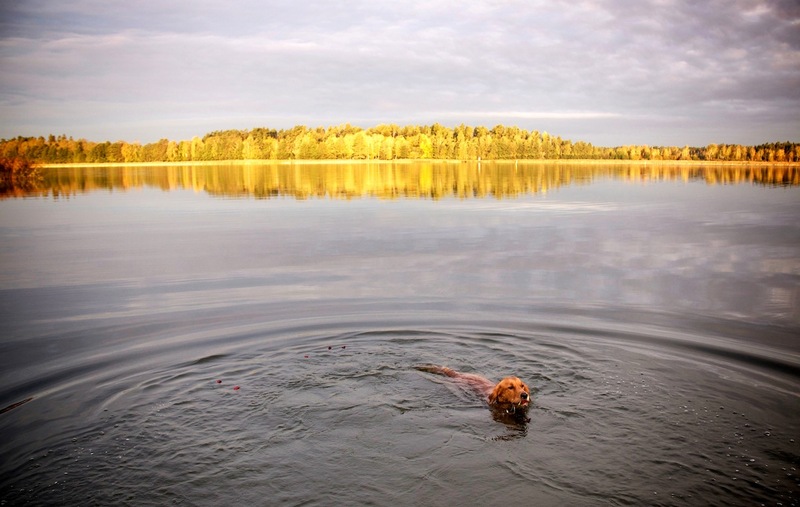 Great photos – great memories – and the dog diving after the rose petal is very special! Nothing better than a big wet dog bringing you rose petals to mend a broken heart!!! I do know how you feel having had to put my best friend, Sam, to sleep last year and I do miss him still — and so much!! Thank you for sharing this, Fiona! You must miss your lovely boy very much. He was such a sweet companion. Hugs. beautiful shots. the third one is spectacular, calendar quality. Real friends are those that we carry around in our heart; that is the real treasure and gift in this world. Dogs are our loyal friends. Ruby seems very playful. 🙂 Beautiful photos! Some pictures with beautiful light and autumn color, wonderful Oscar! I have to confess my friend, it breaks my heart to visit here. I loved Oscar…well as much as anyone can through the internet☺ I just can’t imagine what your heart is going through. Ruby warms the soul. Thank you for your comment. I try to focus on the positive and feel thankfulness for all the happy years we had together. Good for Ruby – we will all be glad to see her again! She is very handsome ! What a good idea to throw rose petals in Oscar’s favorite diving place ! It’s interesting how dogs can focus on small things and give them their undivided attention. Ruby looks exactly like young Oscar! This is a wonderful tribute to him. Think of all the good memories in gratitude. Ruby will give you great joy! Ruby is a fine looking dog. How wonderful that Ruby is there to give you joy and companionship. So hard to lose a dog . 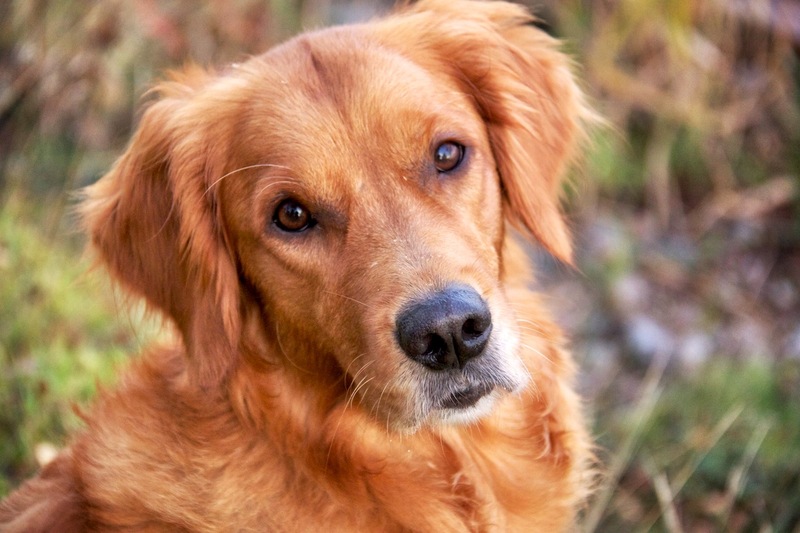 Ruby is a field golden retriever – the old original type of retriever that has its origins in Scotland. Ahhh – that retrieval of the rose petal was a lovely gift. i am smiling at my computer screen!! i am so very happy for you!!! Such a beauty- as well the lake as Oscar. I am so sorry to hear of Oscar’s passing!!! He truly enjoyed his life!!! And I am glad that a piece of him lives on, in Ruby!! She looks to be a happy dog, too. I love the image of her diving in after the roses!! Dear LadyFi, this posting, tender with love for both Oscar and Ruby, reminds me of that song from “The Lion King.” I think it’s called “the circle of life.” Peace. Isn’t she a beauty. Certainly, Oscar’s spirit did not fall far from the tree. I love her retrieving one of the rose petals as if carrying a little part of Oscar back to you. Dogs are so intuitive. And now I’m all teary-eyed. Such beautiful images of Ruby enjoying Oscar’s favorite hangout! I truly love your third image, Ruby posing on the pier. 🙂 Very happy for you that she has become a permanent part of your family. Ruby is beautiful. The images touch my heart. I can still see Oscar there even if he isn’t in the photo. Beautiful little girl, Ruby and Oscar will be loved always!! It’s such a blessing to see part of Oscar in Ruby. She certainly has fine form! What a loving face! I miss my cat of 23 years, lost last January at that ripe old age. Awesome – I’d love to see more dog photos on your blog. You’ll certainly see them on mine! what a beautiful ceremony you had in Oscar’s honor. and how sweet to be able to have a piece of him in Ruby. she is beautiful! Wonderful photos and what a great way to honour your beloved Oscar. I’m so glad that a part of him lives on in Ruby! What?! Oh, Oscar… 😦 It’s good though that you have Ruby now. I was feeling sleepy while visiting bloggity friends and dropping comments. Now I’m so awake. I will miss Oscar :(. I miss him too! Thank you for your kind comment. I am sorry that you have lost your friend. You know that I know how that feels. I am glad that you have someone to sneak into your heart and make the passing easier. What a wonderful tribute to dear Oscar. I’m glad Ruby has a forever home with you! Oscar!!!!! Oh no. My heart is breaking for you and your sweet Oscar. I know how much you loved him and I hope you know how much joy your photos of him and his beautiful spirit splashed across my computer screen so many times means to me… all of us really. I am so very sorry for your loss. Touching, the way how she follows Oscar! Beautiful tribute and fantastic shots and colors. I’m glad to hear that you now have Ruby as your own. I look forward to seeing more of her. I’m counting on it Fiona 🙂 So happy you have Ruby, and she has you. The dip in the water to the rose petals but also picture 3 is awesome. As he sits there as lord and master of the jetty. Just beautiful. Compliment. Så fint att strö ut rosblad till minne av Oscar! och otroligt härliga bilder!! http://spygarden.com/2013/08/03/rip-madison-marie/ Our beloved golden passed a little over a year ago (link is to her obit). We still miss her. Al the best to you in grieving over Oscar, sounds like a wonderful golden. The first pic instantly reminds me of a photograph of Oscar diving off that jetty. It was a real treat indeed. And you are right – a part of him lives on in Ruby. She’s beautiful. I was wondering what had happened to your blog. I tried to visit yesterday. Hope it gets sorted out soon! Oh no – that’s awful! Hope the hosting team can help you recover your blog and your pictures! It appears it’s been hacked. At the moment I have my words backed up but not my photos. I’m not sure what I’m going to do going forward. Right now I don’t feel much like starting again. I may feel differently later. If you haven’t already, back up your blog. This is happening to lots of people! A wonderfully sweet post and what a wonderful gift Oscar left you. Ruby is adorable! What a cute girl! It must have filled you feelings when she jumped into the water and returned with one of the rose petals. It sure did that to me. Your tougher than I. It took me two years to carry on when Hudson died. But he lives in the enigma of the name. Going from boy companion to girl companion will change the way you see. Trust me. It certainly hasn’t been easy – but I have to look forward while still treasuring all my good times with Oscar. These photos stir up deep feelings of love and I am so much better for having seen them! Our golden passed a few weeks back. Seeing Ruby’s sweet expression stirred a yearning. Somehow getting a new dog is the final goodbye to the old- not something to rush into. You have a beautiful blog and I will enjoy following. Awww, what a brilliant tribute. Thank you Ruby!